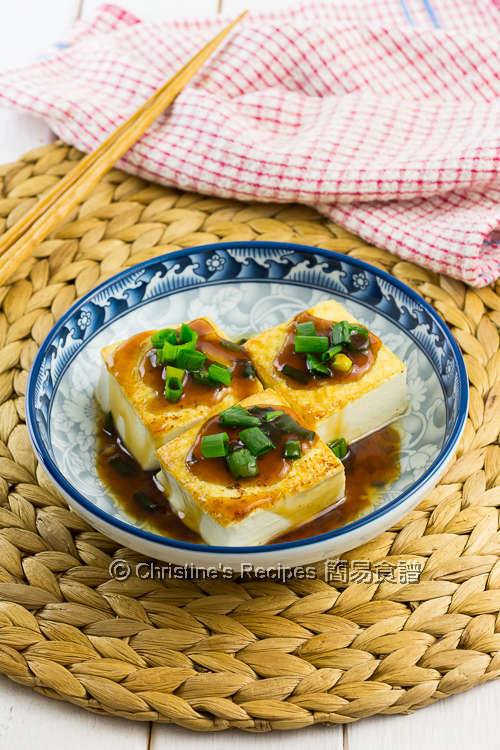 This is a simple and homey tofu dish. Tofu is so easy to cook. All I need is to prepare some sticky and yummy teriyaki sauce to go with it. Tofu doesn’t cost you very much, yet gives you quality nutrients. If the tofu is quality, it gives you some soy aroma too. How satisfied I felt while watching my husband having a bite followed by another without stopping. 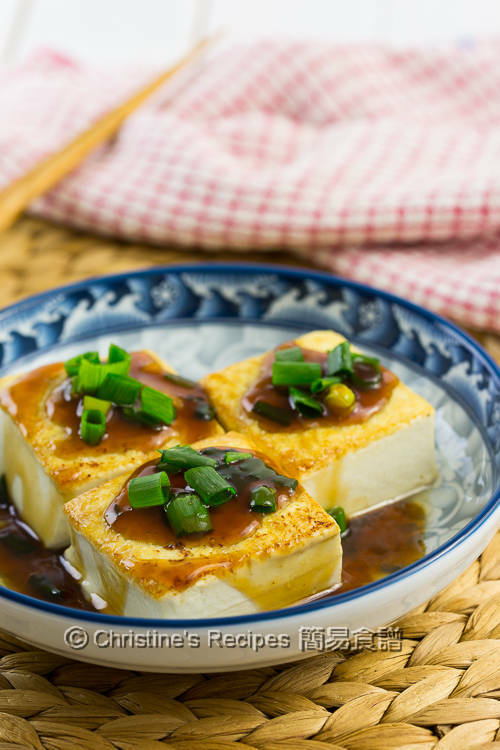 It’s so amazing that a humble tofu could be turned into something you don’t want to miss. I used medium-firm tofu as it’s much easier to handle while pan-frying. It won’t be easily broken up if you flip to the other side. Just simple as that. 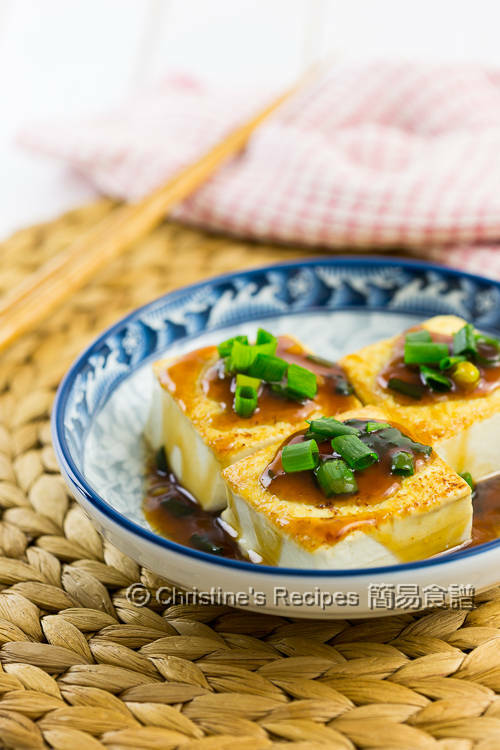 You can also make perfect and good-looking pan-fried tofu. I can eat it like that without any sauce, seriously. The teriyaki sauce take the whole dish up a level for sure. Wipe dry tofu with kitchen papers. Lightly coat with corn flour. It helps absorb the excess water. Set aside. Heat oil over medium high heat. 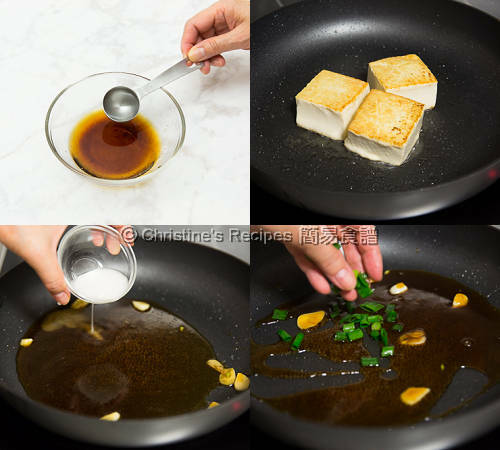 Pan-fry tofu until both sides are brown. Dish up. Set aside. In the same wok, sauté garlic. Pour in all the sauce ingredients. Bring it to boil. Add spring onion. Pour over the tofu. Serve immediately. Make sure the tofu is dry enough. Be careful that hot oil will spill out if there’s any water dripped into the hot oil.